A lot of your poems, such as the ones in your chapbook, are autobiographical. Why did you choose to tell these stories through poetry rather than as nonfiction prose? That’s a great question, and one I’ve thought a lot about. The poems from my chapbook grew out of a class I took with the impossibly incisive poet Leilani Hall, where we were tasked with composing a series of poems through a historiographical or documentary lens. When I asked myself what was important to document, what I could actually speak to with some authority, I couldn’t think of exploring anything else but a private sort of history. So I guess you could say the form was decided before the content, but I did ask myself a lot about how the subject matter was refracted through the verse form in ways that were different from various other prose forms. And what I think the verse form does is lay bare the subjectivity inherent in documentary writing, regardless of genre. Rather than some pretense of neutrality, lyric poetry invites a subjective reading of a history, and in that way maintains the charge of that history in ways other forms can’t, or at least not to the same degree. One is invited in the subjectivity of lyric poetry that works to document to give value to the imagined and mis-remembered–helping us to realize that it’s not only the physical or factual details of a history that compose our memory of that history, but all the peripheral things, too. Other poems of yours contain instances of the speaker interacting with other poets, writers, or philosophers. What do you think these interactions do to the form of these poems? How do these mental interactions affect the line? Those poems can’t help but absorb some of the qualities of the figure with whom the speaker is interacting–that’s part of the point, I think. Part of my interest there is the way the poem can act as a kind of liminal space between the speaker’s consciousness and that of the particular poet or figure, etc. There’s a certain playfulness there for sure, where the speaker can imagine how that interaction might play out, but there’s also an investment in reverence, lineage, and identity. For example, a poet who has appeared in my work a couple of times is Allen Ginsberg. Ginsberg was one of the first poets whose I work I absolutely fell for, and I feel like I came to know a particular kind of empathy through his poetry. So interacting with him through a speaker can be a short-cut to try and tap into that empathy, as well as to explore issues of influence, and so on. Plus, if we’re being honest, it’s fun to talk to poets we like, especially when that’s no longer a possibility in the physical world. What is your ultimate goal as a poet? In other words, what do you hope your words, out there in the world, will do? Man, that is a huge question. I can already smell the existential dread. I suppose my ultimate goal as a poet is to write poems that do what all great poems do: bridge the gap between one person and another, between one person and his/her experience, between a person and the world. I hope my poems generate the kind of empathy that requires people to rethink their assumptions about themselves, their neighbor, and the world, and invest in a deeper, more nuanced understanding of all those things. It’s a tall order, I know, but you did use the word “ultimate,” and I do think this is possible. The generation of this kind of empathy probably just happens in such small, often invisible ways that we don’t recognize it. At the very least, it feels like a worthwhile pursuit. What are you working on right now? How do you want your poetry to evolve? I’m currently working on my first full-length collection. I’m actually close to have a completed manuscript, though I anticipate the revision process will take a while yet. This next collection is not working in the same documentary vein; it’s focus is exploring the tension and relationship between one’s physical environment and their inner world and experience. Having lived all my life in the mountainous and/or urban spaces of Southern California, driving from Los Angeles to my current home in North Dakota was a powerful experience. To come up against that incredible expanse of empty space felt almost baptismal, and I was actually unable to write for weeks. What could I possibly say to that void? But over time, and as I continued to ask questions, those questions themselves turned into poems, and the book started to take shape. I don’t know if I give much thought to how I want my poetry to evolve. In many ways, I feel like I’m still asking the same questions and exploring the same themes that I was years ago–I suppose there’s enough mystery in some of these big questions to sustain me. I do hope that I can resist becoming overly metaphysical in my work, and stay grounded in the earthly. The temptation to leap into the ether is definitely one I content with, and have to watch out for. What’s the most challenging part of writing a poem? What’s your favorite title of a poem or poetry collection ever? That would have to be Tony Hoagland’s collection, What Narcissism Means to Me (2003) followed somewhat closely by Jeffrey McDaniel’s Chapel of Inadvertent Joy (2013). Titling books of poetry well is incredibly difficult. You’re pursuing a PhD. What are your current scholarly focuses? Yes, I am. I’m obviously interested in contemporary poetry, especially the contemporary lyric and the way the more traditional elements of the lyric translate through various other forms and movements. I’m also interested in literary Modernism. I’ve written some on Wallace Stevens and James Joyce, but I’m also interested in modernism as an international movement. It’s fascinating to me to study how and where what we recognize as modernism appears at different times in different countries. Another area that’s been intriguing me lately is more postmodern American fiction, especially as involves and plays against the rise of science fiction as a major sub-genre. The fact that books like Neuromancer still feel so contemporary really blows me away–and worries me a little, too. That’s all I have for you–thanks! No, no. Thank you, Jackie, for humoring me. 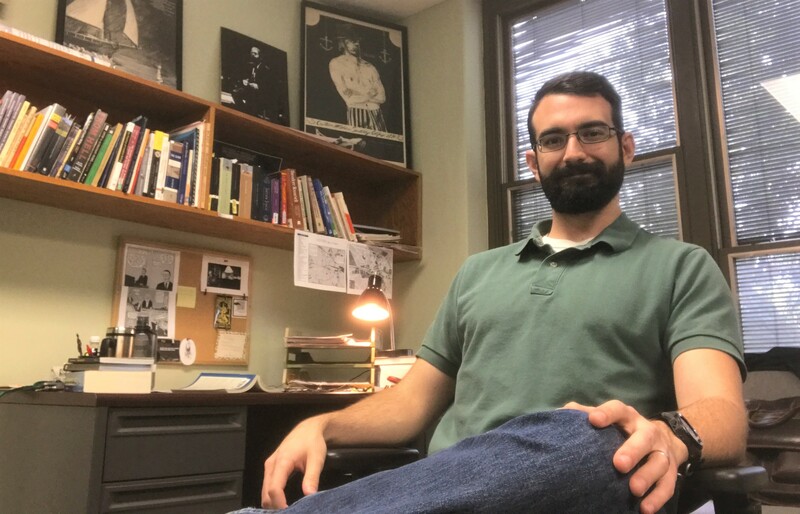 CODY DEITZ hails from Southern California but currently resides in Grand Forks, North Dakota, where he is a Ph.D. student in English at the University of North Dakota. In his poetry, he explores the spaces between physical geography and the metaphysical inner spaces it influences. In that way, he is very much a poet of place, but he is also invested in language itself—its capacity to bridge the gap between one person and another. He is a recent winner of the Academy of American Poets University Prize, and his poetry and translations have been published or is forthcoming in various literary journals including Ellipsis, Literary Orphans, NAILED, the North Dakota Quarterly, and others. 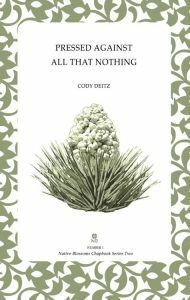 His first chapbook, Pressed Against All That Nothing, was published by Yak Press. When not writing, reading, or teaching, Cody spends his time with his wife prowling the city for good food, working on cars, and avidly playing video games.